These heirloom beans can be found in the U.S. called Good Mother Stallards. 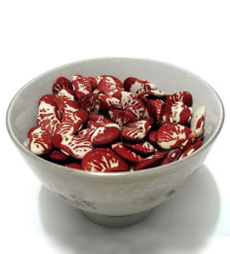 They are similar in coloring, but wider than, Anasazi beans, also known as Jacob’s cattle beans. Dense and delicious, they also exude the most perfect pot liquor of any bean according to Rancho Gordo, which sells the beans. Photo by Luciano S. | IST. We at THE NIBBLE have gone to the ends of the earth (figuratively) to uncover the most delicious and nutritious rice, beans, and grains. Jasmine rice pudding? Barley risotto? Be adventurous: Simple substitutions can make the difference between a bland starch and the dish everyone insists you bring when you visit. If you have suggestions, comments, or want to tell us about your favorite rice, beans or grains, use the Contact Us feature on this page.